Trampled by Turtles brought their Midwestern, toe-tappin’, pogo dancing, slow romance, sometimes frenetic tunes to the Media Club this past weekend in Vancouver. 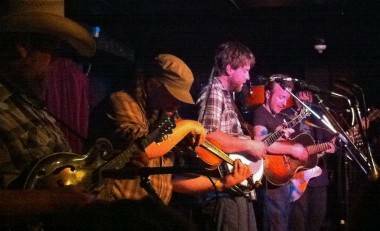 The folksy bluegrass band from Minnesota has garnered acclaim for its live shows, making a name for themselves by touring relentlessly. Esquire recently included them in an article, ’15 Great Bands We’d Never Really Heard of Before SXSW’ – their 2nd year in the Austin music festival lineup. 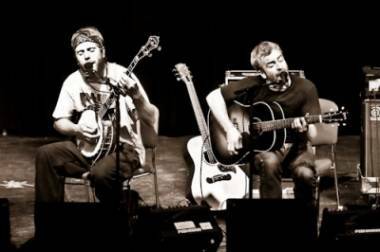 On tour with their 2010 release, Palomino, the Media Club show marked the first time Trampled By Turtles has played in Vancouver since forming in 2003. A five member outfit that includes banjo, fiddle, mandolin, bass and guitar in their repertoire, Trampled by Turtles‘ live show sometimes belies the presence of a drum set or synthesizer in the band’s ability to rock out and carve a strong, often fast, beat. After demonstrating the quick hands and impeccable coordination that they’re known for, the band also took the tempo down for a few songs – but that didn’t zap the energy in the intimate, sold-out setting. The show mixed tracks off the new record with old favourites, like “Codeine” which debuted on their 2005 Devil and the Blue Sky album. Singer and songwriter Dave Simonett crooned about heartbreak and self-medication, while audience members hopped up and down like they were on crack cocaine. Influences include a wide range of artists, from Wu Tang, Black Sabbath and Neil Young. Maybe that’s why it’s hard to label their sound. There’s something for everyone. Yet their melancholy melodies and sometimes dark lyrics, such as in the song “Codeine“, keeps the mainstream at bay. Tracy Roach, a long-time fan who travelled from Minnesota, said going to TBT shows is like her version of being a Deadhead. She’s been all over the U.S. and now in Vancouver. “You have to see them live,” she said, to get the full experience. The band plays to sold out shows in California this week before heading back to the Midwest this summer to begin the music festival circuit. This entry was posted in concert reviews and tagged concerts, Media Club, Music, reviews, Trampled by Turtles, Vancouver. Bookmark the permalink.